What started life as a small family run business, is now regarded as one of the major UK garden building retailers. Waltons have been in business since the 1800s and they are a garden retailer who offer a little bit of everything. There are NOT usually many, if ANY, Waltons voucher codes floating around online, but if they are out there, here at WhatShed we will know about them and keep you informed. We are not here to waste your time, we simply want to make sure that you are getting the best Waltons deal possible and that you are not getting messed around by one of these sites that claim they have amazing Waltons discount codes. Each month we regularly do a round up and check direct with the merchant and post all the results below. Waltons.co.uk are offering a standard 5% off discount code. Waltons.co.uk are offering a University staff discount. You can get 5% off the whole basket value with select .ac.uk staff emails. Email direct to see if you qualify. We know that if you have come to this page you are looking for a discount code for Waltons, as we explain further up Waltons dont often issue discount code. 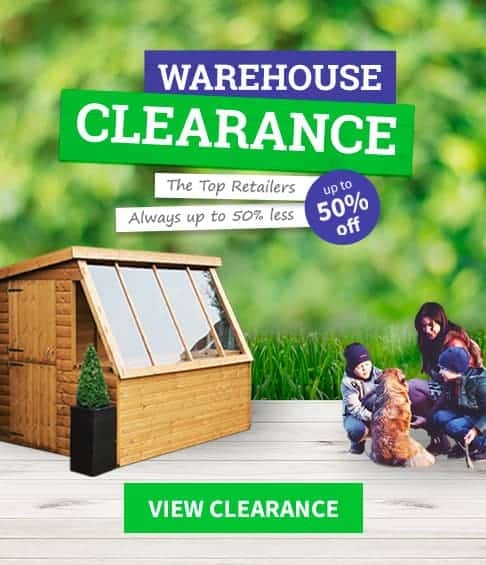 As such we thought you might like to see what are some of the best discounts that are currently on offer from other garden building retailers. The best tips that most people who SAVE money at Waltons use. Waltons do not make it as easy to find their best and latest deals like some other retailers do, but do not worry, as below we have some of the best Waltons deals that are going on right now. We will not mess you around at all and if there is a way to get a great deal or just save a few extra pounds, then it will be listed here. At WhatShed, we do not just want to make sure that you know what is the right shed for your garden or what summerhouse will allow you to relax best, we also want to make sure you are getting, to borrow an expression from across the pond, the most bang for your buck and that is what these Waltons deals will do. Waltons do have a very active social media profile and they do list their current deals and vouchers on their Facebook and Twitter pages, so be sure to have a look on there. Just be warned that their Twitter and Facebook pages are more about tips and ideas, so you will have to scroll through them to find the deals and offers. Check here for their latest special offers and promotions: Waltons do not actually have as many special offers or codes as some of the other garden building retailers, but if you do want to know what the latest Waltons deal is, then you can find it on their homepage under the Unmissable Offers banner. This is very easy to find and we do like the way they have featured it so prominent on their site. The only thing about this, is that you never know what is going to be here when you click it. For example, when we clicked it while writing this guide, the offer was for an Executive Log Cabin, but the next time it could be a shed, a summerhouse or something else. They offer free delivery to most parts of the UK: Most of the products that are for sale here can be delivered free of charge to most parts of the UK. There are of course some exceptions, but they do deliver for free to many, many places. The reason we have this listed as one of our top tips, is that you do not actually need a Waltons voucher code to get free delivery. It is just something that is included as standard and does not require any extra work on your part to make it happen. Many of the money saving sites that we will be talking about a little later will make it sound like you can only get free delivery through them, but that is not the case at all. It may be hard to find, but there is a sales section here: We do not know why Waltons do not just have a sale banner on their site all the time, as there are always some kind of offers available here and it would make it so much easier for people to see them all. However, if you type in ‘sale items’ to their search engine, then you will be shown what items have money knocked off them. Best of all, there is no need for any kind of Waltons discount voucher or a Waltons Coupon Code to make this happen. We know this is not the easiest way to find items that have some money knocked off them, but at least it is there. When you first get the search results, you will notice that they have sheds, summerhouses, playhouses and everything else they sell all jumbled together. But they do let you tinker with the search a little bit so you can get it to just show you the sheds, for example. We have seen some very nice discounts here, so if you do want to see what they have on offer this is the best way to go about it. You can get interest free credit to help you purchase something a little more expensive: Believe it or not, flexible payment options are something that are actually new to Waltons. But rather than hunting around the internet for a Waltons voucher code that is going to make it so you can purchase your dream garden building, we suggest having a think about spreading the cost. Any one of their products that are priced £750 or over, can be purchased using one of their payment plans. One option sees you paying for your summerhouse, log cabin or whatever it is you have purchased over 12 months. You do this and you will actually get interest free credit, so this is a great way to spread the cost and not have to pay a whole lot of money to do so. You can pay for your garden building over 24 or 36 months as well, but each of these options will include interest, so please keep that in mind. Get the latest deals via their newsletter: Waltons do have a newsletter which will keep you up to date about the various Waltons deals and promotions that they have going on. They do not exactly make finding out about this newsletter easy, but if you scroll to the bottom of their homepage then you will find a section there where you can put in your email address and they will keep you informed about the latest Waltons sale and other special offers that may be going on. A round-up of all the current Waltons voucher codes we found online. Waltons is a retailer that here at WhatShed, we really like and we find that they have a good mix of products that are low priced and high end as well. This is why they are one of the top garden building retailers in the UK and also why so many of these money saving sites claim to have Waltons voucher codes, special offers and in general promise you many ways that by going to their site you are going to save a lot of money. These deals, most of the time, are just a complete waste of your time and that is why we have listed below the most popular money saving sites when it comes to Waltons deals and coupon codes. The sites below are the most popular ones when people are looking for Waltons voucher codes and other deals. We made sure to have a really good look at each site so we can tell you why they are wasting your time and will not actually save you any money. We used the most common search terms for Waltons which are: Waltons Voucher Codes, Waltons Coupon code, Waltons Current Discounts, Waltons Current Voucher Codes and Waltons Sale. Not Many Waltons Voucher Codes Exist! We have been regular visitors to the Waltons site for many years and we can tell you, that over that time, we can probably count the amount of Waltons voucher codes we have seen on one hand. They do have many deals and sales during the year, but voucher codes are really not something that they offer, so beware of any site claiming to have the best Waltons voucher codes which is what many of the sites below say they have. What They Claim? VoucherCodes.co.uk are a site that claim to have the latest Waltons voucher codes. They actually make the claim that the codes and deals they have are current to whatever month it is you are looking at their site. They also have a section that really annoys us, and that is a section about other sites that may interest you. This is just a sneaky way to try and get you to click on more of their links. What We Found There really is not a lot happening on this site. The Waltons deals that they do have are for things such as the Waltons newsletter and the fact that they give free delivery. So you are not actually going to be saving any money by coming to this site, as you will get these same deals directly through Waltons. What They Claim? There are not really any bold claims on this site telling you that they have the latest and greatest Waltons coupon codes or anything like that. But they still do have a section dedicated to Waltons. It is always a little bit worrying when a site cannot get the name right of the company they are trying to save you money from! What We Found We found a lot of Waltons deals on here that were claiming to save you a considerable percentage on sheds and deals for other garden buildings. The problem we have, is that when you click on these links you just get taken to the same place. They have a deal for pet houses and this takes you to the exact same place as their deal that is supposedly going to save you money on a shed. Some of the deals that we saw on this site do actually exist, but you will not be linked to them through here, so just go direct and save yourself the time and hassle. DontPayFull.com – Has expired codes and deals! What They Claim? DontPayFull.com is a site that does not pop up all that often when we are looking at garden retailers and after spending some time with the site we can see why. In their Waltons section, they do have what looks like a respectable amount of deals, but they do also have an expired section near the bottom of the page, which is something we never like to see. What We Found Many sites have a section that is dedicated to old and expired codes, we are not saying we like it, but we are used to seeing it. What really bothers us about this site is that the very first Waltons voucher code we tried (which they have in their current codes section by the way), did not work! While this is a site that wastes your time, at least they allow comments and many people seem to have called them out on their fake or expired codes. We feel it is best to just stay away, as you will not be any financially better off by coming here. What They Claim? ReVouchers claim that they have worked out how long on average a Waltons voucher code will last and what kind of saving on average people can expect to get. They also claim that they have the latest codes and deals on their site. They do actually specify the current month, so they are trying to appear as current as possible. What We Found When you click on one of the Waltons deals that they have listed here, you will be told that you are being taken directly to the deal. We found this not to be the case at all, as we were just taken to the Waltons homepage. So even if one of the deals that ReVouchers has is actually valid, you would still have to manually search for it on the Waltons site anyway. So really, coming here before you go to Waltons will just waste your time and not result in there being more money in your pocket once you have purchased your shed. What They Claim? Once you have read the little bit of background information about Waltons that they have here, you will then notice that they have a section of what they claim to be up to date and current Waltons discount codes, coupons and vouchers. What We Found Let’s start with the current deals that they have listed here. Now to be fair, when you click on one of their Waltons deals, you will be taken to that actual part of the site. Our problem is that these are not really deals. You see, they just have links to the log cabin section or the playhouse section and these links are not saving you any money at all! Also, at the bottom of their page there is a section that has old and expired Waltons voucher codes that we cannot stress enough you need to ignore. VoucherCodeSale.co.uk – Has no deals at all! What They Claim? VoucherCodeSale.co.uk are quite the boastful site, as they tell you that you have come to the right place if you are on the hunt for the latest Waltons voucher codes and other great deals. They tell you all you have to do is click their link and you will see all the latest and best Waltons deals that are available right now. What We Found Well we clicked on the link and expected to be taken to a magical land where there would be incredible Waltons discount codes. But as you have probably expected, that did not happen at all. All their link does is take you to the Waltons homepage! They do not even link you to the sale section. Oh, but the site does plenty of old and expired codes for you to waste your time with. What They Claim? Despite having one of the largest selections of Waltons deals, coupons and codes, VoucherCodesPro.com do not really brag or give you a whole lot of information. What they do say though, is that their voucher codes are the most current ones out there. They even specifically tell you the last date their Waltons section was updated. What We Found There are a whole lot of Waltons deals to scroll through on this site and we will be fair and say that these are actual deals that you can get from Waltons. But calling most of them deals is really stretching it. For example, the kinds of deals that you will find on here are ones like this: Log Cabins For £799.95. Which, when you click just takes you to the log cabins section of the Waltons site where they do actually have log cabins for the price this money saving site says. But our issue is that this is not a deal that is exclusive to VoucherCodesPro.com, it is just the standard price Waltons are asking for. So going through this site as a middleman is utterly pointless. What They Claim? There are not too many Waltons promo codes listed on VoucherCloud.com, but they do say that the ones they have listed here are current and still valid. They do, though, have one of the longest Waltons information sections we have ever seen! What We Found With just a handful of Waltons deals here, there really is nothing that makes spending any time on this site worth your while. Most of the so called deals that they have are just odd. For example, one of them states that you can get a shed for under £200. This is actually true, but do you really need to come to a site like this to link you to the Waltons sheds section in order to see it? This is not a horrible site, but wow is it a site that will just waste your time and leave you no financially better off at all. UKPromoPro.com – Has far too many old and expired deals! What They Claim? We have been to UKPromoPro.com to look at various garden retailers and they seem to be claiming the exact same things with Waltons that they are all the rest. This is that they have the latest Waltons voucher codes and deals and that they are current for the month you just so happen to be viewing their site. What We Found We found many deals that are just straight links to various sections of the Waltons site. Links that will not save you any money at all. You will get no better deal by going through this site, so do not waste your time. The worst thing about this site, though, and this is something we have said time and time again when talking about UKPromoPro, is their expired Waltons deals section. It is not just because they have too many of them, but because they tell you they might still work. No, they will not work. They will just waste your time and not save you any money at all. NewDiscountCodes.com – More expired deals than valid ones! What They Claim? We really did not find any bold claims or bragging on NewDiscountCodes.com. We did find that their Waltons deals section was rather lacking and they are really not all that clear on what Waltons discount codes or deals are valid and which ones are not. What We Found We looked over this site a few times because we were quite shocked at what we saw. They only have one actual current Waltons deal and this is just for free delivery, so really they are offering nothing at all. They do have other Waltons voucher codes on here and more deals, but these are expired. While they do actually tell you that these are old deals, it is not exactly clear. This is a site that will not save you any money at all, so you are best just heading direct to the Waltons site. Thanks Brett, we just updated the sheet to reflect this.